Today I found out the origin of the Olympic Rings. The Olympic ring symbol was designed by Baron Pierre de Coubertin in 1912. The idea of using rings intertwined with one another came from the Union des Sociétés Françaises de Sports Athlétiques (USFSA), which had two interlaced rings as their symbol and which Pierre de Coubertin was for a time the head of. 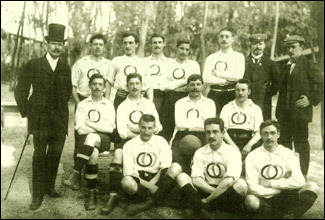 It was founded by two French sports associations that merged, hence the two interlinked rings. As far as the colors, this was also from the USFSA’s logo design. Teams within the organization would wear white shirts with the interlinked rings being red and blue (the three colors of the French flag). …the six colors [which includes the white canvas background] thus combined reproduce the colors of all the nations, with no exception. The blue and yellow of Sweden, the blue and white of Greece, the tri- colors of France, England and America, Germany, Belgium, Italy, Hungary, the yellow and red of Spain next to the novelties of Brazil or Australia, with old Japan and new China. Here is truly an international symbol. Prior to 1951, the International Olympic Committee contradicted this, stating that each color represented a continent, contrary to what de Coubertin, who came up with the design, said. The IOC at the time listed the colors as: blue for Europe, yellow for Asia, black for Africa, green for Australia, and red for the Americas. There is a myth that Pierre de Coubertin actually borrowed the Olympic Rings symbol from the Ancient Greeks. The origin of this myth comes from when British authors Lynn and Gray Poole in the 1950s took a trip to Delphi while working on the History of the Ancient Olympic Games and saw a stone carved with the Olympic rings symbol. They assumed, and subsequently included in their book, that this was a stone carved in ancient times, when it fact it was carved for the 1936 Summer Olympics. The president of the Olympic Organizing Committee had it carved for a torchbearer ceremony at the stadium at Delphi. After the ceremony, they left the stone there. The 1912 games were the first Olympic Games where a country from all five continents (with North and South America considered one continent) competed. It was shortly thereafter that Pierre de Coubertin came up with the design, with the first known instance of it being in a letter head sent by de Coubertin, with the rings and coloring all done by his own hand. By 1914, de Coubertin had made this into a flag, but the 1916 games in Berlin were canceled because of WWI, so the flag didn’t make its debut until the 1920 Antwerp games. The official creed of the Olympics was inspired by a 1908 sermon given by Ethelbert Talbot, former Bishop of Pennsylvania. The creed for the games is: The most important thing in life is not the triumph, but the fight; the essential thing is not to have won, but to have fought well. There is also an Olympic Oath which is: “In the name of all competitors, I promise that we shall take part in these Olympic Games, respecting and abiding by the rules that govern them, in the true spirit of sportsmanship, for the glory of sport and the honor of our teams.” It too was suggested by Pierre de Coubertin. The first of the modern Olympic Games were played in Athens, Greece on November 15, 1859. These were the first Greek Olympics in around 1450-ish years, with the original Olympic Games beginning around 776 BC and ending around 393-426 AD. The revival of the Olympics was primarily thanks to Evangelos Zappas and Panagiotis Soutsos. Zappas was inspired by the 1833 poem Dialogue of the Dead, by Panagiotis Soutsos, which lamented the loss of the greatness of Greece, including the loss of the Olympic Games. Soutsos himself also went on to lobby for the reestablishment of the Olympic Games, but was unsuccessful. Zappas, though, had something Soutsos didn’t, namely, a fortune. The IOC takes their symbols extremely seriously and will happily sue anyone who tries to use any interlocking arrangement of five rings or use of the word “Olympic” in a name or title, like “Olympic Paint”, which also incidentally had a logo with a paintbrush made to look like a torch, or “The Olympic Hopefuls” band, which were forced to rename themselves just “The Hopefuls”.